High Deductible Health Plans are the Worst Strategy in Health Care - Allay Inc. The most common response to rising healthcare costs, over the last 8+ years, has been to raise the out-of-pocket liability for employees (deductible + out-of-pocket-max)…and it’s a giant, counterproductive mistake. 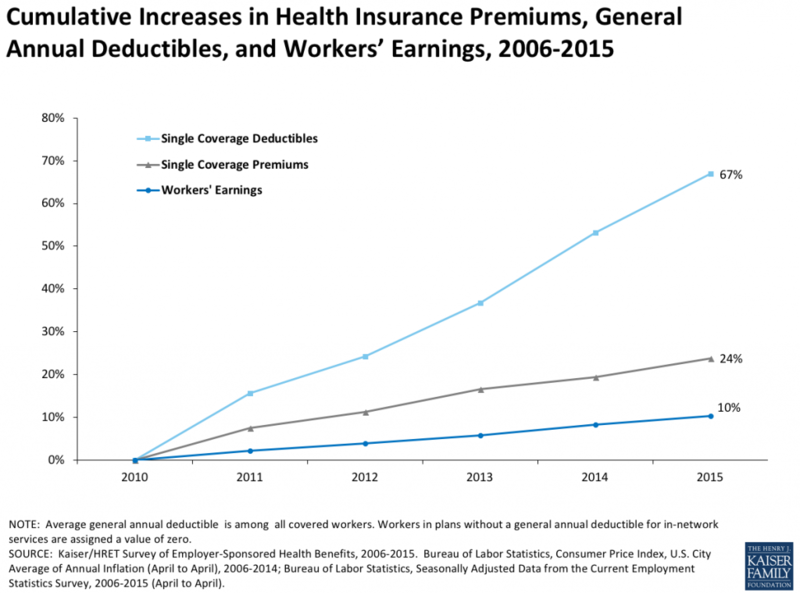 The graph below demonstrates how the rise in deductibles has outpaced growth in both premiums and wages. Relying on high deductible plans to mitigate those rising premiums puts undue financial strain on employees and leads to worse health outcomes. Conventional wisdom tells us high out-of-pocket costs will appeal to a person’s sense of frugality and consumerism and lead them to make smarter healthcare decisions because of “skin in the game.” The unstated and widely unmet requirement, however, is available cash flow to actually purchase healthcare when the need arises. the math in its simplest terms is this: if a person’s personal savings is less than their deductible, they’re not going to get the healthcare they need to remain healthy. They are going to defer care rather than invest in their health and this will lead to higher costs down the road and cause problems for everyone. The math in its simplest terms is this: if personal savings is less than the deductible, they’re not going to get the healthcare they need when they need it. 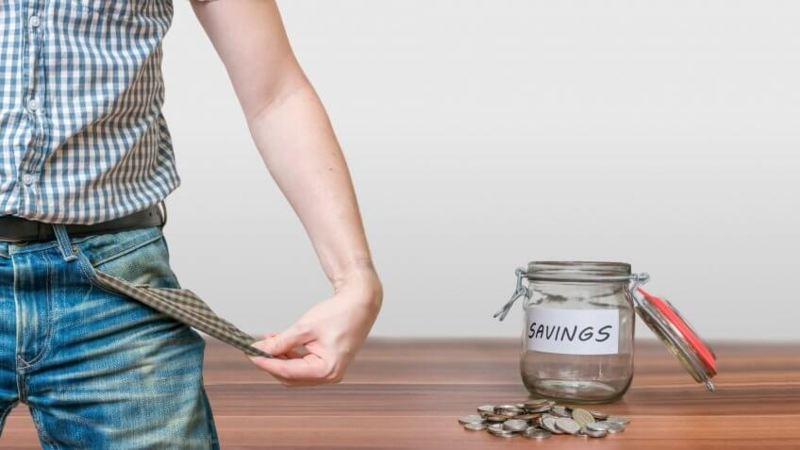 The average American under 35 yrs old has less than $2,000 savings in their bank account and 57% of all Americans have less than $1,000 savings. Compare this to the avg out-of-pocket liability on an employer-sponsored plan for single employee coverage ($3,822) and on the federal marketplace plans ($6,909). This gulf, between the average savings and the amount of money a person needs to spend before insurance kicks in, is causing people to defer the care they need. Evidence for this phenomenon also comes from research done outside the healthcare realm. Each tax season in America, across all people who get a tax refund, the average refund is $3,000, and for 40% of people who get a refund this is the largest influx of cash they receive each year. Researchers at the JP Morgan Chase Institute wondered how people spend this once they get the money back. When they observed spending behavior they noticed a 60% increase in healthcare spending immediately after the tax refund was received compared to healthcare spending in the 100 days prior to the refund. Additionally, 62% of this increased spending was done in person, which means most of this spike in healthcare spending was on deferred care not on paying off bills. This pattern of healthcare activity speaks volumes about how terrible a High Deductible Health Plan is for the average employee. The ACA has capped the limit on out-of-pocket maximums and deductibles, so this game of pushing those limits as a means to lower premiums is no longer a viable strategy (thankfully). It’s easy to understand why brokers and employers accept increased out-of-pocket liabilities on their health plans; it’s a variable that can be easily manipulated and understood and it serves as a quick win for cost containment. But this is short term thinking. To truly help people get the benefits they need AND to reduce costs long term, advisors and employers must implement strategies to reduce the cost of healthcare itself while simultaneously increasing access. Yes, it is possible to do these two things at the same time. strategies recommended in “Breaking the Status Quo” by thought leaders such as Nelson Griswold, Scott Cantrell and others who contributed to the book. Like it or not, employers are in the healthcare business. This onus, however, comes with the power to radically improve healthcare access while simultaneously reducing healthcare costs in America. Benefits advisors must lead the way. Direct Primary Care, mandatory second opinions, transparent medical markets, fiduciary pharmacy benefit management, independent TPAs, and value based plan designs all have a part to play in moving the needle to lower health costs without sacrificing the financial welfare or health of employees. Quickly and effectively modeling the moving parts is how Allay’s self-insurance quoting platform allows you to assemble health plans with various TPA partners and other vendors that include all or some of these plan building blocks. We want to make it easier for advisors to implement solutions to the rising cost of healthcare. Sign up for a beta here to start evaluating different programs for your groups.